Seventy percent of online orders are abandoned. Finding ways to get them back to your site to complete their order is a pivotal part of your eCommerce strategy. Any way you can close those sales will increase revenue—even by giving up some of that revenue with a coupon code. Adding a discount to your recovery campaign helps you tip hesitant customers toward purchase. 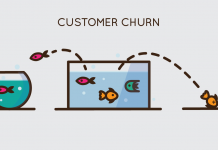 While you might feel like discounts for already lukewarm customers give away too much, the data shows that they work. Jilt (email marketing for eCommerce) looked at 275,045 discounts attached to recovery emails. Not all of those led to recovery, but the ones that have—over 12,000 of them—produced $2,456,852.79 in attributable revenue. That works out to over $200 in recovered revenue per discount used. 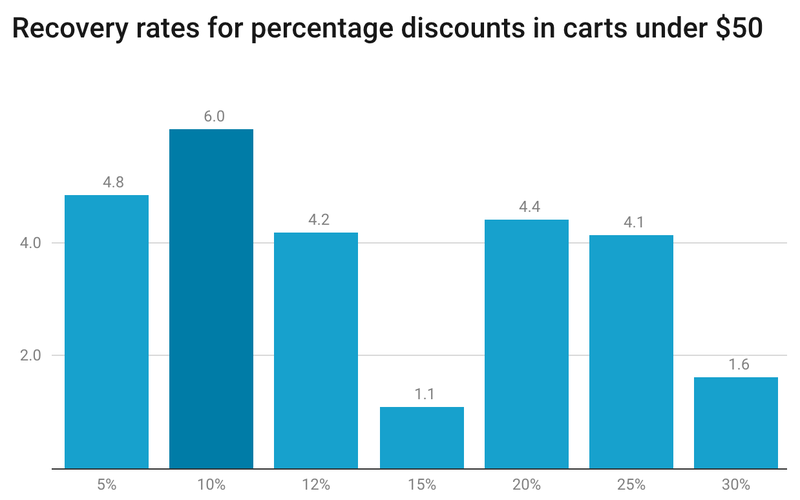 Percentage discounts—you give customers a 5 percent, 10 percent, or 20 percent (for example) discount on the value of their cart. Fixed discounts—the customer receives a coupon for flat dollar amount off the total cost of their cart, like $5, $10, or $20. Free shipping discounts—the customer doesn’t have to pay shipping costs. The smaller your average cart value (ACV), the higher you can push a discount. A 20 percent discount on $20 is only $4, where a 20 percent discount on $250 is $50. Depending on margins and cost of goods sold (COGS), smaller eCommerce sellers can potentially discount at higher percentages without as much lost revenue. Additionally, the smaller you are, the higher you might have to push your discount for it to be effective. One or two dollars off a $20 item might not be enough to get a potential customer back to their cart. But a $4 savings might push them to the decision you want. In many ways, it comes down to customer psychology—bigger dollar figures are more enticing even if the percentage off is actually lower. 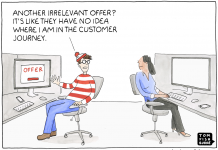 If you are selling higher-priced items, you need less of a lure to get people back. Twenty-five dollars off a $500 item feels like a substantial saving even if it isn’t a huge percentage. With that in mind, trying to maximize the perceived impact of your discounts while also keeping percentages down makes the most sense. But do these discounts actually work? Small ACV stores might sometimes push discounts up to 20 or 25 percent, but should they? Should shops selling big ticket items actually be using discounts above 5 percent? While some stores are using higher discounts with decent recovery rates, the increase doesn’t actually help them in the long run. Using a 25 percent discount is still relatively effective at recovering carts, but less so than a 10 percent coupon. And, of course, higher discounts cost more in real dollars, as well. 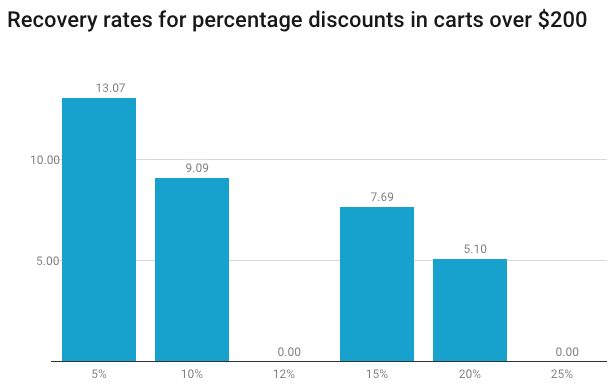 For carts with values above $200 the most effective discount was 5 percent. It was the same for the carts in $150-$200 range. Shipping discount emails recover less than $1. Fixed discount emails recover approximately $5. Percentage discount emails recover almost $12. These numbers also take into account the lost revenue due to a discount. 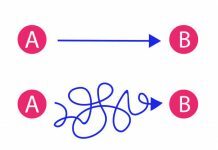 If the original cart value was $25 and the discount offered was 20 percent, then the revenue recovered was only $20 instead of the full $25. If you’re thinking about including discount coupons in your recovery-email campaigns, percentage discounts are your best bet for getting started. They not only recover the most revenue by a long shot, they also tend to recover the most carts than the other two types of discounts combined. Recovery emails work. Even simply reminding a customer that their potential purchase is waiting helped bring them back to the cart eventually. It’s the eventually part that discounts can really improve. Recovered revenue is always good, but when you’re waiting days, weeks, or even months to see the benefits of your abandoned cart recovery campaign, it’s impossible to track long-term success. Being able to recover the potential lost revenue from an abandoned cart is one of the quickest ways to boost customer value. When you offer up a discount during the recovery campaign, it will incentivize the customer to come back and complete their purchase even faster. By combining these strategies and finding what works best for your customer base, you’ll be able to turn those lost opportunities into another sale.